Westinghouse Portable Generator – There are many good reasons why you may need a portable generator. If you own a home or business, you should have a generator on hand to deal with emergencies, power outages or similar events that you can’t predict. Generators are not only a good backup for your home’s electrical supply during catastrophic weather events. You can also use them for job sites, outdoor parties, or when you want to hit the road with your RV. You’ll need to choose a quality generator that you can rely on. The Westinghouse Portable Generator Model WH7500E is one of the highest rated generators on Amazon and well worth taking a look at if you are prepared to invest in your home and family’s safety. 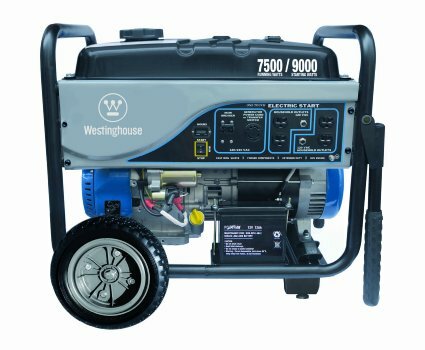 The Westinghouse Portable Generator Model WH7500E boasts 7,500 watts of power and features a user-friendly electric start that can be activated with just a simple push of a button. Virtually anyone can operate this generator safely and easily! The generator holds 6.6 gallons of fuel, giving it the impressive ability to run for twelve hours straight. The Westinghouse Portable Generator Model WH7500E is easy to assemble and comes together in a flash right out of the box. With powerful all-steel construction and multiple electrical inputs, plus a cast iron fan guard, this powerful generator was built for both high performance and safety. One of the other great perks of buying this particular generator is the company’s amazing customer service. According to many consumers, the customer service agents were accessible, friendly and willing to troubleshoot on the phone. 68 percent of the Amazon reviews related to the Westinghouse Portable Generator Model WH7500E are overwhelmingly positive, and many of them specifically mention stellar customer service. Another reason why this model seems so popular is the fact that it’s so powerful and has such longevity. Many reviews focus on how the generator can power various rooms in their home simultaneously. Since usage is tracked on a large LCD screen, you always know where you stand. Dimension measurements of 27.2 x 20.5 x 22 inches (L x W x H) and a weight of 201 pounds. You have a high leverage handle along with solid wheels measuring 10 inches in diameter. The dual folding handles are designed with ergonomics in mind, and the tires never go flat. The fuel tank carries up to 6.6 gallons of fuel, and that’s enough to run for up to 12 hours at 50% load capacity. Starting it requires only pressing the one-touch electric start system, and it also comes with an LCD display for the hour meter. The three position electric start makes it easy to operate, and it also comes with a Comfort Grip manual recoil handle, compression release, and transistorized ignition. The noise it produced is significantly reduced by the Pulse-Flo muffler. The construction includes an overhead valve design, cast iron cylinder sleeves, and forged pistons and connecting rods. The construction is all-steel and the electrical connections are fully enclosed. The Automatic voltage regulation offers precise and dependable power. Additional safety is provided by the cast iron fan guard. You get two 120 volt push button circuit breakers for over current protection along with a toggled mainline 240 volt circuit breaker. The quarter-turn Nema twist lock connector also gives a secure connection for available power cord and other devices. Easy maintenance is guaranteed by the maintenance-free brush excitation. There’s also a 3-year warranty. This generator comes with an impressive three-year warranty, which gives customers increased peace of mind and lets you know that it truly is a solid product. The only real downside to the Westinghouse 7500 watt Generator is that it is heavy and can be cumbersome. Weighing in at over 200 pounds, this hefty generator is difficult to move. Some reviewers have found its wheels to be rigid and unable to deal with the massive weight of the generator itself. Still, this minor complaint does not negate all of the positive attributes of the Westinghouse Portable Generator Model WH7500E. So why all the love for the Westinghouse Generator Model WH7500E? Undoubtedly, part of the adulation is due to the 7,500-watt capacity. One buyer hooked up his furnace and a couple of refrigerators, along with turning on the TV and DVD player plus the lights in the various rooms of the house, and it didn’t go past the 50% capacity mark. This is the kind of capacity that a job site may need. It’s also very easy to use, starting with the simple assembly upon delivery. It even comes with a rather basic spark plug wrench along with a few wrenches, plus the handles, the wheel kit, and a bottle of oil and a funnel. While it certainly does make it easier if there are two of you to put the generator on its side to attach the wheels, it’s easy enough to do it all on your own. Starting it is a snap with the one-touch electric start system, and you can monitor your usage with the LCD screen. And if you have any questions, you can call and actually get a customer service rep who know what they’re talking about. The construction is also superb in build and quality. You get a hint that Westinghouse built this thing to last because of the 3-year warranty which not every generator manufacturer can match. But many of the first buyers of the Westinghouse Generator Model WH7500E have reported that it still works flawlessly even after a few years of use. The safety features are top notch as well. Finally, even though it weighs more than 200 pounds the wheels and the handle make it very easy to move from location to location. 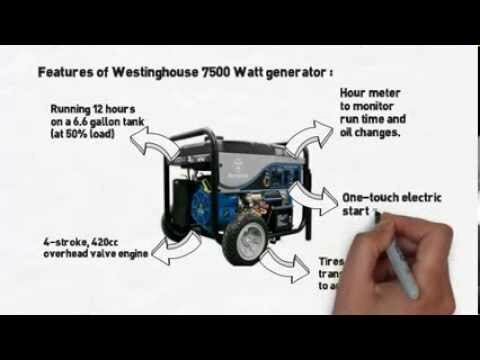 Is Westinghouse 7500 Watt Generator Perfect? Well, it does have some weaknesses which you may need to address. Let’s start with the wheels, which are integral for portability. It doesn’t use a threaded bolt and nut, and instead a pin and hairpin cotter attaches the wheel. It still works well even on muddy or rough terrain, however. It also comes only with a single 30 amp outlet. Anther 30 amp outlet would have made it more versatile. And of course, some people may be worried about the rather late entry of Westinghouse in the consumer generator industry. The company doesn’t have an extensive history in this kind of appliance, although Westinghouse itself has a fine reputation for quality build. And many satisfied customers are saying that you need to pick the Westinghouse Portable Generator Model WH7500E (Check prices here). So Should You Buy the 75oo Watt Westinghouse Generator? If you need the 7,500 watts in available power, then this is probably an excellent option. You get the power you need, and you that power on a pretty much consistent basis. The Westinghouse Generator WH7500E is very easy to use and will last a long time. Just make sure you actually need the 7,500 capacity. Westinghouse offers lower capacity portable generators, and they may be more suitable for you if you only modest power. You can cut down on the expense, and the generator becomes more portable and easy to bring along. But if you need to use it for a job site, go buy this one. In fact, you can buy this one even for modest power consumption if you also intend to use it to backup your home power supply. Even in a power outage, you can power PC for work, your TV for entertainment, your lights for convenience, the refrigerator to preserve your food, and your heating and air conditioning system for your comfort. If you need a generator that can go the distance, has the capacity to power multiple areas at the same time, and comes with a warranty that guarantees customers satisfaction, the Westinghouse Portable Generator Model WH7500E is a great option for you.